I think it’s obvious by now that I love food. I don’t love it as some people do, just to eat. I gain pleasure from eating but that’s just a sliver of the whole tart. I think about ingredients constantly. I look at photos of food on my iPad before I go to bed at night and the happiest time of the month is the very beginning when I get to browse new magazines on the shelves at work. Currently, I am taking a food worker’s test to enable me to keep working at my job. It’s boring and makes me want to press forward to the actual test but it won’t let me until I hear the computer man explain all of the rules and regs of proper food handling with retro graphics. The animated bottle of chlorine bleach with eyes is cute, I will admit. Food blogging on the other hand is a whole other push and pull with me. I love the interest I have in it but am unsure of why it is I really do it. Maybe you can tell me what you get out of it? I don’t have any nutritional information to pander. All I want to do is throw out my ideas and hope some of them resonate with you. Summer has me feeling creative to the degree where I’m trying to do as little as possible with the choices I have. I love spending time in the kitchen putting things together but I’m pulled away by the desire to do less of that and more of spending time with this brief spell of nice weather. Or I’d like to do a good job balancing the two. Maybe you have no such conundrums and if you’d like to put yourself in my shoes, pretend you love playing guitar or video games as a hobby on a day that makes you sick at its perfection. Or that you love the outdoors but also want to think of 7 creative ways to eat boiled eggs in a week. I made this recipe because I bought 3 pints of cherry tomatoes on sale last week and another one (not on sale sad face) yesterday. In short, necessity. I had run out of my usual ways to use them after grilling them, putting some in a frittata, smashing them on day-old bread with olive oil, and roasting them to eat with fish/pasta/other things. All of those ideas are simple and you might find some on this blog as well (1, 2). This recipe was 18,000 times the life I love and it is the most fun to make on a warm day that beckons you outside with a tall glass of chilled sparkling water and a plate of watermelon cubes covered with the perfect ratio of chaat masala to melon. I might be a little obsessed. Matt found out what giardiniera (it means garden in Italian) was after an attempt to copy an Italian beef recipe he saw on another food blog. It called for the briny condiment to be a part of the sandwich, as they do in Chicago. I bought the “wrong kind” of giardiniera so we had to go back and make sure it was “Chicago-style”. I think that means that it’s spicier? I’m still researching that. But what I do know is that when you pickle in-season vegetables in the summer, you will have made giardiniera. The vegetables in Chicago-style jar were cut into smaller pieces than in the Italian giardiniera I bought by mistake. If you can’t find pre-made giardiniera where you live, you can sub packaged olive salad (look in the condiment aisle) or make your own at home* (see in ingredients list). 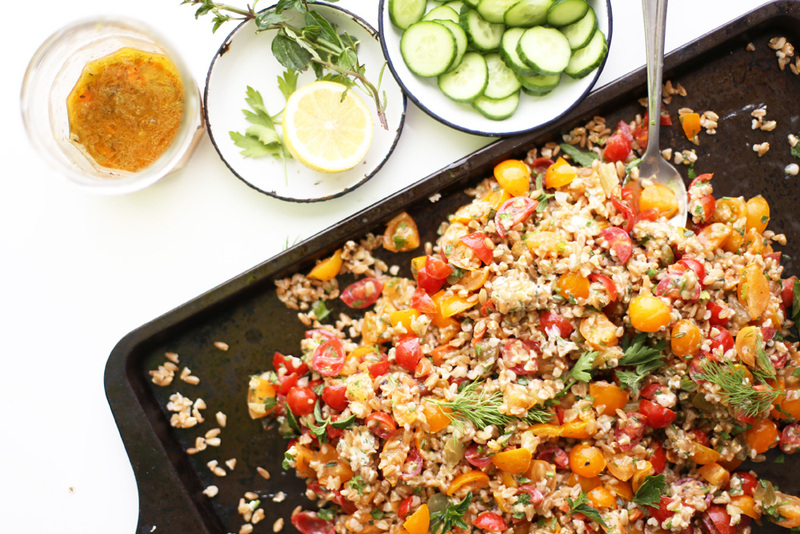 Eat this on it’s own or as a side with roasted or grilled veggies or meats/fish. Place the cut tomatoes in a bowl and using your hands, gently coax them to release some of their juices and seeds. Dig your fingers to the bottom of the bowl and toss them around with a light hand about 5 times. Once you notice the tomatoes getting juicier-looking, tip the bowl to check if you have enough of juice collected at the bottom. You will need 1/4 cup. Pour that much of the juice into a separate bowl and set aside. 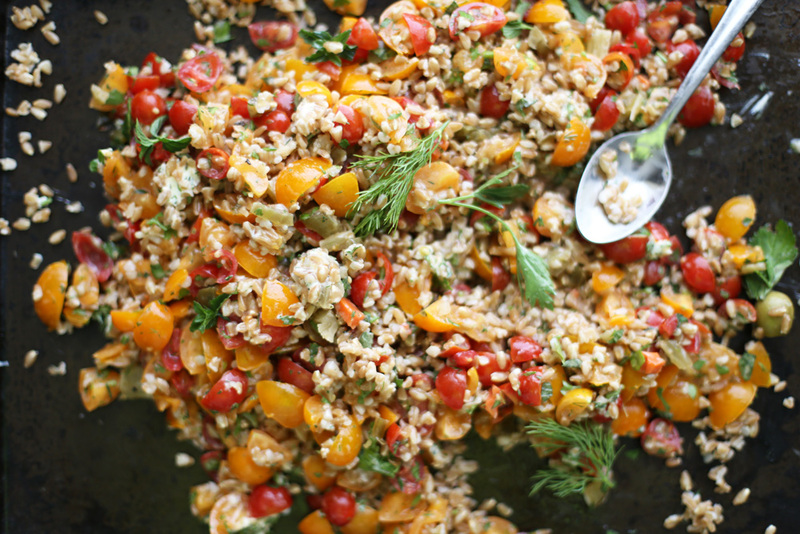 Add the chopped herbs and goat cheese to the tomatoes and lightly toss with your hands to combine. 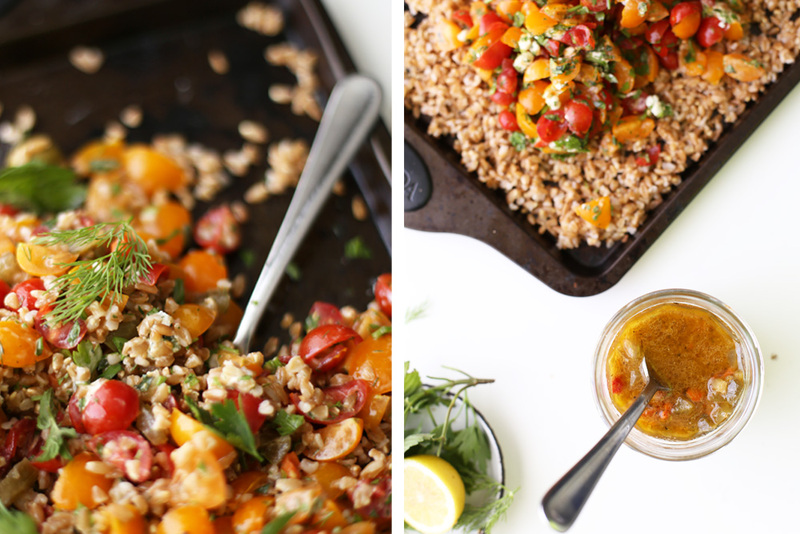 Spread the farro on a flat sheet pan or a large serving dish and top with the tomatoes. Gently combine and then mix in the dressing or individually dress on your plate, according to taste. Whisk all the ingredients together in a small bowl and season with salt and pepper, to taste. You can make this ahead and store in the refrigerator for up to a week.